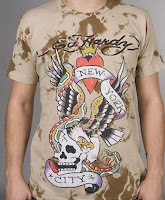 I want an Ed Hardy t-shirt. So I'm told a place on the beach has them and I'm thrilled. We go out there and they had some gorgeous ones. What no one told me is that they're freaking $100 each. Even the tank top was $58. The picture above is one I liked. Some are like almost $200 and I can't find many on eBay that are authentic that are under $50. Even though I worked extra hard last night, made some awesome money and he told me to buy myself one, I can't justify a $100 t-shirt, I just can't. What if I dripped my Starbucks on it? I do that sometimes you know! I'll keep looking and maybe find a good eBay deal. Darn you, Ed Hardy! PS they keep them behind the counter at the store so no one can steal them. They also have the neat $250 sunglasses. Darn you again, Ed Hardy!